Quality Products From Aurora Pets – Toys, Treats, Bowls, And So Much More! As we get closer to the holidays, sometimes we forget about our closest friends. Our dogs need love too. Let me tell you about a great company that has all of the good stuff Rover wants and needs. 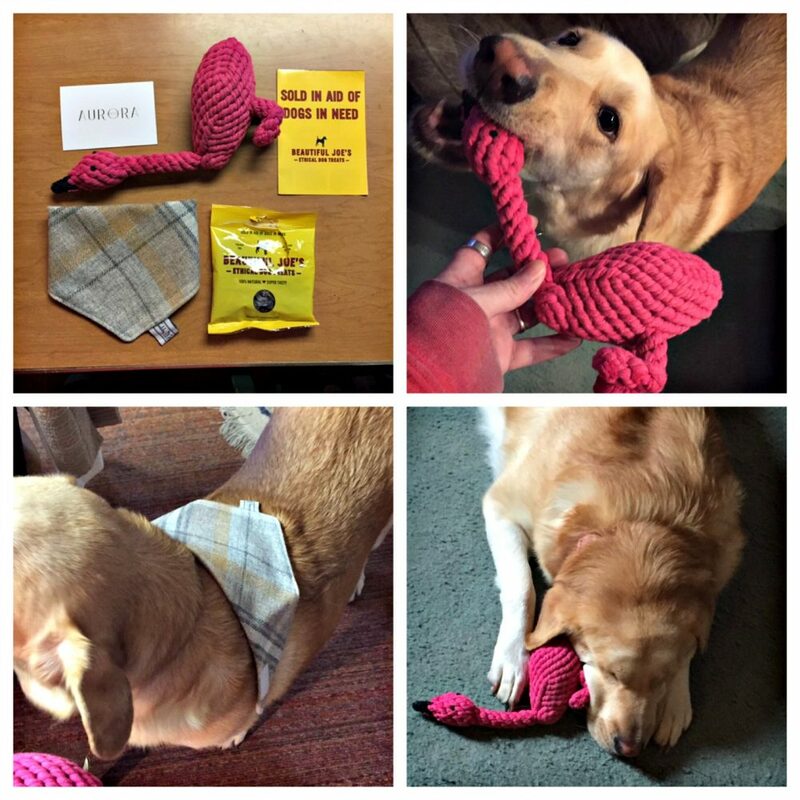 Aurora Pets not only has quality products, but they also have beautifully made dog rope toys. I received a wonderful pink flamingo rope toy that my dog is in love with. She even sleeps with it! I also love the doggie bandana and yummy treats they sent. So does my dog, Cassie (as you will see in the pictures)! So, as I said earlier, the rope toy I received was the Jax & Bones Fran the Flamingo Rope Dog Toy. It is durable but made for light chewers. My daughter has a dog that destroys everything, so I imagine this is not for her. Each rope dog toy is hand tied and dyed using non-toxic vegetable dyes. It will fray after some time, but this is normal and good actually. It will act as a dental floss, but if you find bigger pieces, you can simply remove them. When I gave this toy to Cassie, she was hesitant at first. She has a weird issue with textures, so I was a little worried. After a few minutes, she picked it up and began chewing. I kept an eye on her and actually saw her sleeping with it. Fran the Flamingo has a new friend for sure! The dog bandana I received was the Teddy Maximus Sand Shetland Dog Neckerchief. Unfortunately, Cassie was a little big, so she didn’t quite fit it. Don’t worry girl, I’ve been there! It’s made of Shetland wool, has a nice plaid look, and velcro’s around the neck. The treats that I received were Beautiful Joe’s Natural Liver Dog Treats and trust me, they were a big hit! Cassie isn’t too picky when it comes to treats, but she absolutely loved these. Any single product would make a great gift, but imagine how amazing a couple of them would be! Aurora Pets is a responsible company that will be working to be plastic-free by the end of 2019. Being a luxury dog shop, they strive to be the best at customer service and offer brands from international designers. So, what are you waiting for? Go and get Fido (or Rover) something special now! There are a lot more products than I was able to share. You can click on the links I’ve provided to see for yourself.